To date, my DMs Guild reviews have focused on digital copies of people’s work. Today’s review will be different in that I will review both a digital and paper copy of the same work. An Ogre and His Cake by Christopher Walz and Emmet Byrne is available as strictly a digital download, a print-on-demand (POD) copy, or both. I will try to persuade you to buy both the digital and POD versions of this great adventure. Product Length/Inclusions: 24 pages. The digital version includes the color and printer-friendly versions and 8 maps and several kid-friendly character and spell sheets including 4 pregenerated characters. As you can tell from the cover, An Ogre and His Cake is an adventure designed for kids. Young kids. The officially recommended age for D&D, according to the publisher, is 12+. Chris and Emmet have created this adventure to be suitable for children as young as 5. Of course, as the DM, you should use discretion. You will understand your players better than the authors. But, this adventure would be okay for children. In this adventure, the players will join Massie Littlefoot, a 12-year old halfling, for her birthday party. But when they arrive they learn that something terrible has happened. 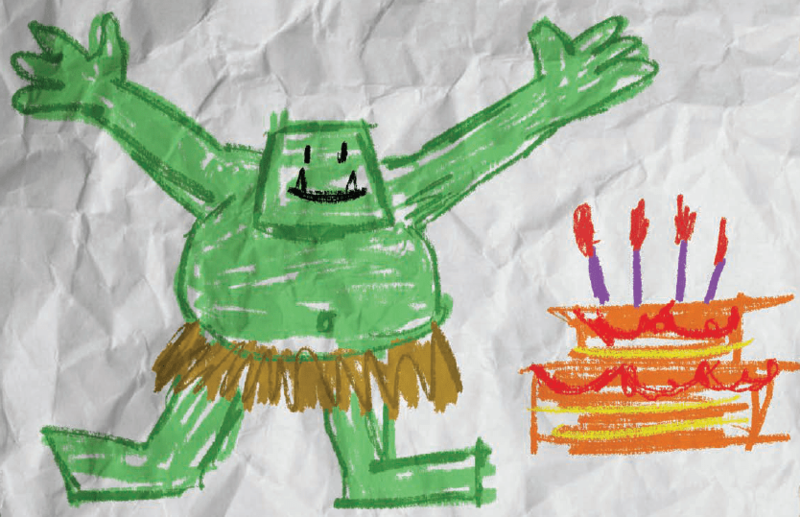 Massie’s birthday cake was stolen by a monstrous ogre named Clonker who lives in the nearby forest. It will be up to the players to recover the cake and save Massie’s party before it is completely ruined. The players will investigate the scene at the bakery and follow the clues into the forest. From there they may encounter pixies, a hippogriff, a doppelganger, and even a small gang of goblins. And of course, they will encounter the titular character, the ogre known as Clonker. Is he truly the monster that the town, Lenimere, assumes he is? That’s up to the brave heroes to discover and resolve. Now that I’ve given you a brief overview of the adventure I need to provide some of the reasons it is worth buying—and I’m advocating that you spend the $15 for the digital files and the premium heavyweight softcover book as I did. When I review DMs Guild product I generally look at five main factors: Originality, Writing, Production, Design, and Cost. If the product is a compelling adventure (or reason to use it) that is well-written with an aesthetic design and balanced encounters that explore the three pillars of roleplaying, then I’m always inclined to give a high rating. Cost is relative to the other four factors. It’s one thing to know the cost of something and another to recognize its value. Initially, you will probably think of Shrek when you start to read An Ogre and His Cake. Clonker is mild-mannered but he’s also temperamental and has few friends. Where this adventure is compelling and convincing is in Clonker’s motivations. Unlike Shrek, Clonker doesn’t embrace his loneliness. He wants friends. But the reputation of ogres precedes him, and his angry outbursts don’t help matters much. He happens to share a birthday with Massie and just wants to be celebrated too. Does Clonker look like a terrifying ogre to you? I’ve reviewed a few of Christopher Walz’s adventures now and he consistently delivers easy-to-read products. He did well with explaining how to use this adventure and gives great advice on how to run it for kids. Each encounter is vivid and memorable. The kids you run this adventure will remember it for a long time. The nitpicker will find a few spelling mistakes here and there. But I can forgive them as they are few and far between. And inconsequential. Quite simply, Emmet Byrne nailed it with the production. This book is beautiful. He and Rob Walz (Chris’s brother) created amazing art and maps. And the character sheets for kids are among the best I’ve ever seen. My favorite character sheet is the color form-fillable ones. They’ve done a great job to simplify an otherwise complex character sheet for young players. You obviously won’t receive these forms if you purchase only the POD version of the file. So, I encourage you to buy both. They are not specific to this adventure. You could use them for all your players’ characters. I’m going to. My kids bring friends over a lot and these are great for new players. Speaking of the POD version. I chose the premium heavyweight paper and received my physical copy within a few days. I love it. The colors are amazing. My 3-year old son saw it and asked me to read this book to him. My gosh I can’t wait until he has the attention-span for roleplaying. This will probably the first one I run for him. The adventure is a bit on the short side for a printed version so displaying it on a shelf won’t have the same effect as a thicker book with a printed spine. But that’s not why we buy physical books, right? At least not the only reason. 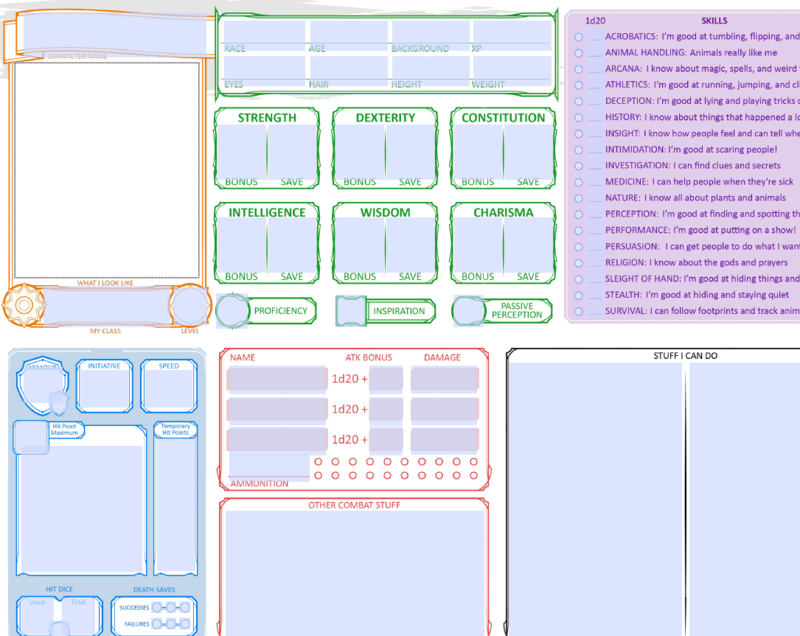 Look at this custom character sheet! It’s fillable and when you click that “What I Look Like” box you can upload a picture! I’ll admit, running games for kids is tough. They tend to catch you off your guard a lot by asking unexpected, but creative, questions. I love that Chris suggests you never tell the players they cannot try something and adhere to the “Rule of Cool”. Basically, if it sounds cool you should not only allow it but also encourage it. This will make it fun for them. Each encounter in this adventure can provoke thoughtful reactions from the players. Even the final showdown could lead to befriending Clonker or enraging him into battle. The encounters are all scalable for weak or strong parties. Furthermore, to tone down the violence in an inherently violent game, you can decide that any monsters or NPCs who lose all their hit points simply run away. No need to be gory if you don’t want to be. Cost is one of the most subjective parts of any assessment. My discretionary income is not the same as yours (most likely) so if I say $15 is inexpensive it may be true for me. But maybe not for you. Instead, I will tell you whether I think the $14.95 price is justified for this product (the premium heavyweight softcover book as well as the digital PDFs with all additional downloads). It is. First, the print quality is professional. Not professional like you sent it to Office Depot for printing and binding. I’m talking it’s on par with what you’d buy from a retailer. The print on the pages doesn’t smudge and the colors are as vibrant as they are in the PDF. Secondly, the versatility of the kid-friendly character, inventory, and spell sheets means you have ubiquity to use them in ANY adventure where you’ll have young players at the table. The maps are perfect for printing and handing to the players (there are player copies and DM copies). Or you could load the maps into a virtual table top program like Roll20 or Fantasy Grounds. But most importantly, the price is justified in that the creators of An Ogre and His Cake give 100% of their profit to Extra Life. If you’re unfamiliar, Extra Life is a charity that raises money for Children’s Miracle Network Hospitals. Let me be clear about this. DMs Guild still takes their cut and the costs required to produce a printed copy and deliver it to you (you’ll pay the shipping) but Chris has set this product page up so the profit that he, Emmet, and Rob would normally see goes straight to Extra Life. It is a one-step process. These guys have foregone a good amount of money for this cause. Please note, this review is NOT based on a complimentary copy as so many of them usually are on this site. An Ogre and His Cake is available on DMs Guild.